SAP is constantly seeking better and easier ways for customers to get support for our products. 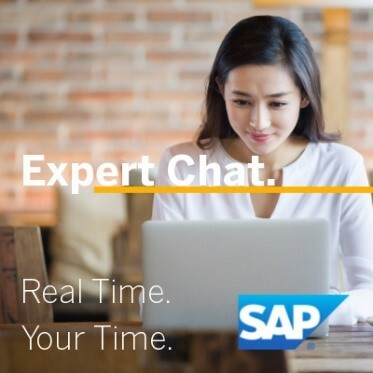 I am very delighted to announce that our Expert Chat channel is officially released on November 30th, and it’s built right inside the SAP ONE Support Launchpad to streamline the process. Anyone can now get real-time product support anytime and anywhere, helping to resolve customer’s mission-critical upgrades in less time than the past. And customers will be talking to a product support expert in real-time! Customers can access Expert Chat through the SAP ONE Support Launchpad, which provides a central place for users to access all support channels provided by SAP. The Expert Chat service is available to customers of every support-level subscription. To learn more about Expert Chat, please click here. To learn how to start a live chat session with an engineer for fast support click here. Please feel free to make questions and give your feedback directly on this blog. As a Partner, every little chat will create an incident and then be counted against your correction share, right? That’s correct, every chat will create an incident. In regards to the second part of your question, could you elaborate further? Thank you! Hello Experts, This is not a quite rare topic, its about Customizing Synchronization, we are planing to configure this functionality between ECC and MDG in controlled by SolMan. But our situation is, we have 2 SolMan systems (landscape) connected to ECC and MGD however we will use 1 SolMan system for Customizing Synchronization. Now my question, since there is a presence of 2 SolMan systems (even though we will be using 1 SolMan) do you think there will be some issue? It’s really good one to get the support faster as a customer. but still some of the component are not available export support engineers. We’re working hard and including more component areas to provide real-time support for our customers. Stay tune.